Merrit Jones grew up in West Columbia and Cayce, South Carolina, and for most of her childhood, she attended predominantly low-income public schools in Lexington County. Jones was a sophomore in high school when her mother, a local school board member, transferred her to River Bluff High School in a larger neighboring district. While still struggling, Jones’s new district had better resources and far less poverty than her old one. Some 70 percent of students in the district where she grew up were either homeless, in the foster care system, or receiving food stamps, welfare, or Medicaid, versus 40 percent of students in her new district, according to state education data. The disparity shocked her at first but then catapulted Jones, who is now a college junior and a fierce education equity advocate, into action. Computers and wireless internet access in the United States seem ubiquitous, yet disparities in school-based technology resources between higher- and lower-income students persist. Some 5 million households with school-age children do not have high-speed internet service at home. Low-income households — particularly black and Hispanic ones — are disproportionately affected. 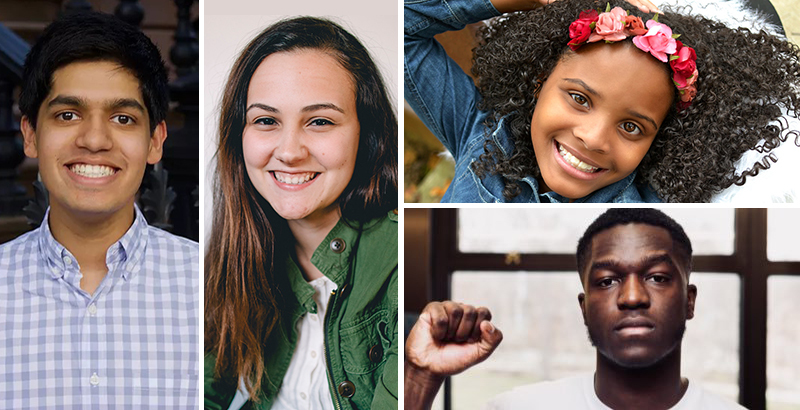 Verizon Foundation commissioned Twitter-savvy Generation Z activists like Jones to lead a social media campaign meant to draw attention to educational inequality and the digital divide. The ongoing campaign launched in the fall and, according to Verizon spokespeople, has convinced a million people so far to pledge their support for education equality by adding their names to a “petition” and sharing it on Twitter. If the campaign successfully raises 2 million voices on social media, Verizon Foundation and its partner Digital Promise will commit to connecting 2 million students with technology and internet access by 2021 and make donations of up to $2 million in tech education resources and tools — a dollar for each person they reach. In addition to the digital divide campaign, Jones is a University of North Carolina at Chapel Hill student and executive director of Student Voices, an organization founded in 2013 that works directly with 300 youth activists to empower students to lead the change they wish to see in their schools and education. Other activists in the lineup include 11-year-old elementary student Mari Copeny, better known as Little Miss Flint, for her fight to get clean water to the residents of her hometown of Flint, Michigan. The city’s drinking water became contaminated with lead in April 2014, but despite ongoing complaints, officials did not acknowledge the contamination until October 2015, long after tests showed elevated lead levels in tap water samples and other tests showed a spike in toxic lead levels in the blood of Flint children. Ziad Ahmed, a sophomore at Yale University and one of the “Top 15 Youth Prodigies Changing the World,” according to Business Insider, and Penn State student Seun Babalola, who interned for Hillary Clinton during her 2016 presidential run, are also part of the six-member group. The Gen Z activists use their social media platforms — together they have more than 110,000 followers on Twitter alone — to spread the message of the digital divide’s impact by amplifying the voices of those they believe are affected most, yet heard least: students. Ahmed is a Princeton, New Jersey, native who started a youth-led nonprofit organization in eighth grade and made Forbes’s “30 under 30” list this year for a millennial marketing and consulting firm he co-founded. Babalola shared a similar sentiment — access to technology has allowed him to build a platform for his activism where he can send a message to millions of people and help create initiatives for hundreds of thousands in a few seconds, he says. Students who face barriers in access to digital learning resources at school also lack access to internet or computers at home. The percentage of U.S. children with high-speed internet service installed in their homes declined from 89 percent in 2010 to 78 percent in 2015, according to the National Center for Education Statistics, The percentage of children who relied on a mobile service or data plans rose from 9 percent in 2010 to 67 percent in 2015, reflecting the exploding popularity of smartphones. Lower-income students are more likely to access the internet from a mobile device with a data plan than a laptop with Wi-Fi. The cost of internet access was a primary barrier for children from low-income families and for children whose parents had lower educational attainment. Access for students ages 5 to 17 also varied by geographic location — more students in suburban areas had fixed broadband (excludes mobile) access at home than students in rural areas. Within each geographic region, gaps are widest when access and use are measured according to income, race, and ethnicity. Corporations like Sprint and Comcast also have initiatives that aim to increase access by offering low-cost internet services or providing high school students with mobile devices and data plans to help combat the homework gap. Verizon’s Robinson believes, however, that there is “a gap in providing a holistic solution.” Computers and internet access are not the only elements to the digital divide. Rising use of technology and computers in school does not mean students automatically benefit from technology-rich instruction. What teachers, students, and parents actually do with the devices and access matters as well, she said. “We need a solution that not only provides the technology but recognizes that we need teachers to learn how to teach differently and that there are critical skills needed for student success: creativity, critical thinking, and problem-solving,” she said. Since 2012, more than 1 million students have participated in Verizon Foundation education programs that engage students with technology, problem-solving, and design-thinking. Verizon Innovative Learning has committed more than $400 million to provide a free tablet with a two-year data plan and learning programs to students at Verizon Innovative Learning partner schools. The VIL schools program started in 2014 with eight schools and grew to 73 at the beginning of the 2017-18 school year. Digital Promise provides one full-time technology coach at each VIL school for two years. The coach ensures that students learn how to use the tools and provides teachers with comprehensive, ongoing professional development on how to effectively integrate mobile technology into their lessons. “We need all elements together to truly prepare kids for what’s going to be more of a digital economy very soon,” said Robinson. Through the social media campaign, Verizon hopes to engage with more students to get insight on their learning experiences and a vision of what would make the experience better. At a time of growing concern over how companies are using data, Verizon spokespeople said the cellular communications giant is not using the campaign to track individuals who pledged or their data, only the number of people who have signed on to support it. In an ideal world, every student should have access to their own device, broadband internet, and trained teachers to engage them with technology and make sure that learning is happening in a meaningful and productive way, Jones, the South Carolina student, believes. However, recognizing students as the primary stakeholders in their education is paramount to narrowing educational inequality.